Conditioning is that key component in sport which yields better athletic results. 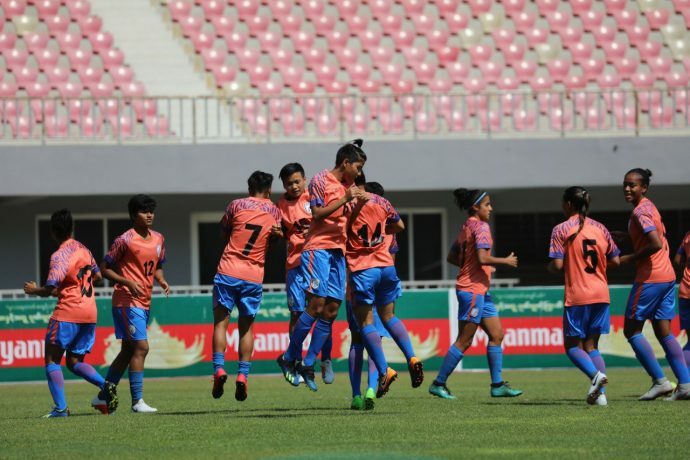 In the age of sports science, there has been a significant stress on strength, conditioning, rehab, stamina, and even the usage of GPS systems, all since the girls assembled in December for the preparatory camp, and the exposure tours ahead. “We understood that in the time frame for the AFC Olympic Qualifiers in Myanmar, we would be playing in temperatures over 40 degrees,” Head Coach Maymol Rocky informs. “The core group is a youthful one, physically very robust, and can match any opposition,” she adds. “This batch of girls can play the 90 minutes without tiring, and if needed, even the extra 30,” she opines. “Better speed, reflexes, and stamina – that’s what we are stressing on. It allows us to defend with numbers, and move the ball faster in attack,” Maymol explains. It wouldn’t have been easy had the team not been provided the GPS technology. The player tracking system (GPS) helps us to understand the players, and monitor their heart rate and workload,” Maymol utters. The newly introduced GPS technology, and their recovery sessions takes a load of their central nervous system, empowering them to go all out for the future course of action. However, recovery stays paramount. In the team hotel, you can see the physios stressing on the importance of recovery to the players. The rooms have been loaded with extra water to keep players from dehydration, with the medical staff checking every player, breaking down soft tissues of some, while releasing tension of others. “We want the players to be cent percent fit and give their all in each and every match, and training session. Recovery is a very important part of that. Mandalay is very hot and humid. So the players need to increase their intake of water, and keep themselves hydrated,” the Coach states. At meals, there is a constant vigilance of what the players are eating. “Diet plays a major key role in fitness, and conditioning. Too many carbohydrates can lead to bloating and stiffness. We have stitched a plan for each player and they follow accordingly,” Maymol expresses. The Women’s national team play their next match in the AFC Olympic Qualifiers Round 2 against Nepal on April 6, 2019.